In the USA, this book is called The Discovery of Middle Earth: Mapping the Lost World of the Celts. The Heraklean Way, one of the most ancient routes in Europe, runs from the Sacred Promontory on the Atlantic coast of Portugal to the Matrona Pass in the Alps. It’s both a real road – you can still drive along parts of it today – and a mythical one, for it is said that the hero Heracles himself created it as he strode across the continent. Its origins truly are lost in the mists of time, but it dates from at least the 5th century BC, well before the Romans had started their world-beating tour. Until the historian Graham Robb pointed it out a few years ago, no one thought to mention, or seemed to notice, that the path runs exactly along the angle of the summer solstice. 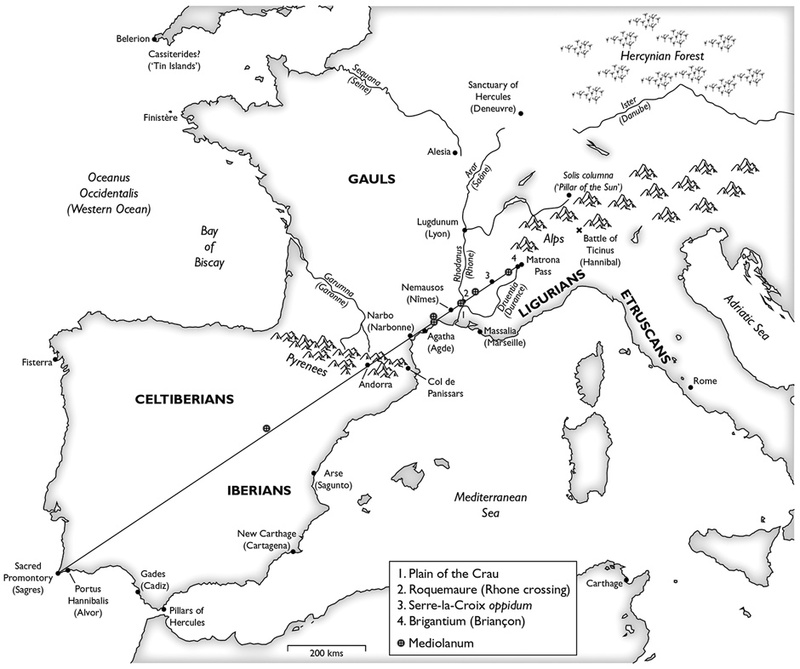 The Heraklean Way from The Ancient Paths by Graham Robb. 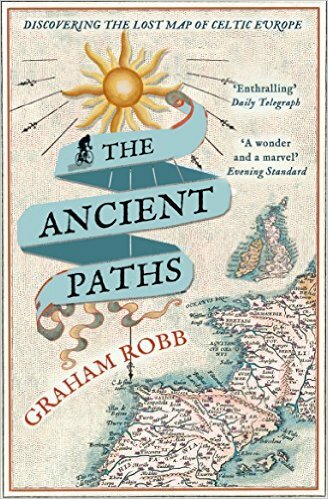 I’ve been reading Robb’s book The Ancient Paths: Rediscovering the Map of Celtic Europe this week. The book is crammed with interesting ideas and vivid history, and it reads like a detective novel as Robb uncovers more and more evidence (or coincidence). When it was published a few years ago, it caused quite a stir, because Robb made the radical suggestion that the Celts were expert surveyors and astronomers, and the famous network of Roman roads that connected the classical world pre-existed the Romans. His ideas may have some implications for historians of astrology too, although this is implicit and not an interest of Robb’s. Robb suggests that the Celts, under the direction of their priestly caste, the druids (which included men and women), were attempting to create heaven on earth using solar geometry over huge distances. In other words, they were following the hermetic rule that astrologers and magicians know: “as above, so below”. Robb argues that the Celts created a sacred grid that ran from Delphi in Greece right up to Scotland and from the Rhine to the tip of Spain. 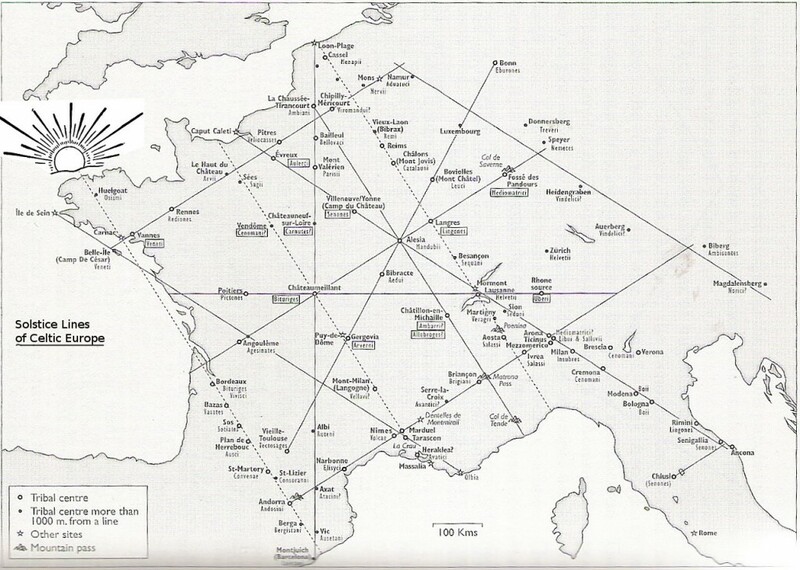 He believes that they used this grid to determine the direction of migration, to choose boundaries and battle sites and to site temples and towns. His arguments are complex and gripping; you really do need to read the book for a full explanation. If he is right, the Celts were versed in Pythagorean geometry. The Celts in question migrated over the Rhine into France sometime in the 5th or 6th century BC, and eventually ended up settling across the continent from Ankara in Turkey to the East to Ireland in the west. They were a loose confederation of tribes with a common culture, who seemed to roam and even emigrate en masse every now and then. These are Iron Age peoples, not the same as those who built Stonehenge or Carnac, and connected by culture not ethnicity. The Gundestrop Cauldron. Among many amusing asides in this book, Robb wonders why modern druids dress in white robes, when you can see from ancient representations such as this that they wore rather chic cycling shorts. Robb does not mention it, but they also had a sophisticated calendrical system. This calendar sychronised the solar year and the lunar months — like the one we use today – and it was based around the solstices and equinoxes. It was necessary for the timing of the important festivals, of course, Samhain, Lughnasa, Beltane, etcetera, and indeed was more accurate than the Roman one. The problem for historians is that the druids wrote nothing down. Knowledge had to be memorised, and the chief source of information about the Celts is their enemy, the Romans. However, I did wonder when I saw one of Robb’s diagrams. He appeared to have drawn part of a rectangular horoscope — the sort still commonly used in India, and historically used in Europe — on the map of France when he traced the solar grid of the Celtics. We believe that the origins of astrology likely lie in Mesopotamia, and that much of the fine-tuning of Western astrology went on in Hellenic Egypt from the first to the fourth centuries AD. But what if those Celts, who spent 20 years studying something, were already practicing a form of astrology well before Christ or the Roman invasion of Gaul? What if our Western astrology, based as it is around the solstices and equinoxes, owes more to those tree-hugging, head-hunting, trouser-wearing, moustache-twirling, street-fighting, proto-feminists than we ever thought? One thing is certain, ancient peoples had far more contact and exchanged ideas and technology much more readily than earlier historians gave them credit for. Educated Romans, Celts and Egyptians had a common language after all: Greek. Of course, I particularly liked Robb’s suggestion that Oxford was the central surveying point for the Celtic map of Britain. That puts this house where I write pretty much in the omphalous. I might step out my front door and, following the line of the solstice dawn, find myself treading one of the ancient sacred ways. I really liked this post. Have you read ‘The Western Way: A Practical Guide to the Western Mystery Tradition’ by Caitlin and John Matthews. They trace the old merchant pathways like the Icknield Way, and cross reference them with ley lines and the story of Helen of the Roads. Haven’t heard of this particular goddess/myth before. Really, really interesting. thanks for the book link. Thanks for the recommendation: I shall put it at the top of my list. Caitlin has actually taken me on a shamanic journey (she lives here in the omphalous too), which was astonishing. Absolutely delightful 🙂 I’m swooning. Adding to my “to read” list. There’s a lot more in there and he writes very well.